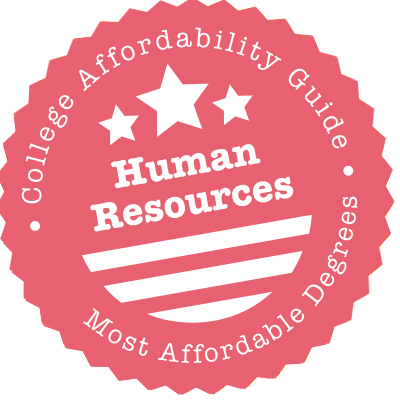 Scroll down to see the most affordable human resources degrees, as well as info on the different types of human resources degrees and HR program accreditation. The Bachelor of Business Administration (BBA) degree offered by the Department of Management at TAMU's Mays Business School allows students to opt for human resource management as the main focus of their study. The department also offers a Master of Science (MS) in Human Resource Management program. The Doctor of Philosophy (PhD) in Business Administration - Management program offered by the department lets students choose organizational behavior and human resources management as their area of concentration. HRM students have access to the Center for Human Resource Management (CHRM), where they can participate in research projects, attend lectures given by HR industry specialists, and build a network of contacts for future career options. Baruch College offers undergraduate and graduate degrees in human resource management. Undergrads may earn a Bachelor of Business Administration in Human Resource Management that requires them to take eight courses in the subject. Students take three required courses and select five electives with topics such as Organizational Design, the Management of Compensation, and Employee Development and Training. Students earning a Master of Business Administration may major in Organizational Behavior-Human Resource Management. MBA students take courses in their major in the second year of the program after completing core courses. Juniors majoring in the subject may apply for the New York Compensation Association Human Resources Management Scholarship. The college has a student chapter of the Society for Human Resource Management. The College of Education and Human Development at the University of Minnesota Twin Cities is home to the Department of Organizational Leadership, Policy and Development. The department offers Bachelor of Science (BS) and Master of Education (M.Ed.) programs in Human Resource Development (HRD). There is also an HRD Graduate Certificate available. The Carlson School of Management offers Bachelor of Science in Business (BSB) and Master of Arts (MA) in Human Resources and Industrial Relations (HRIR) programs. The MA-HRIR program can be pursued on a full-time or part-time basis. Students can also pursue a dual degree in MA-HRIR/MBA (Master of Business Administration). This dual program adds only one year of study to the standalone MBA or HRIR degree. The Department of Management and Marketing at SUNY Oswego's School of Business offers a Bachelor of Science (BS) in Human Resource Management program. Students admitted to the program follow a course of study that is aligned with the guidelines established by the Society for Human Resource Management (SHRM). Required courses include collective bargaining, compensation management, employment law, labor relations, personnel staffing, and social and industrial psychology. Students are trained in several important HRM functions including training and development of employees, compensation and benefit plans, and recruitment and placement. McDaniel College offers a Master of Science in Human Resources Management that teaches students how to increase individual and organizational effectiveness through training, organization and career development. The M.S. is a 36-credit, cohort program that includes four foundations courses, three theory courses and three electives. Human resources management students are also required to complete a capstone experience that includes the creation of a portfolio and the completion of a practicum. Program cohorts consist of 10 to 20 students who take two consecutive 8-week courses together each semester. Classes are offered Wednesday evenings and Saturday mornings, and the entire program can be completed in three years. The College of Business at Winona State University offers a Bachelor of Science (BS) in Human Resources Management program. Students admitted to the program take courses from a variety of disciplines including accounting, business law, economics, finance, and statistics. HRM students can apply to scholarships offered by the College of Business, including the following: Michael Garvey Scholarship (senior HRM students only), Kujak Transport, Inc. Scholarship, and the Dr. Joseph H. Foegen Scholarship. Both the Kujak and Foegen scholarships are open to all full-time HRM students. The Human Resource Management program in Stony Brook University's School of Professional Development offers a Master of Science and graduate certificate program. The curriculum for the MS in Human Resource Management includes 10 courses that provide students with an understanding of employee relations, employment law and policy, evaluation, benefits and compensation systems. MS students are not required to complete an internship, but can complete an internship for credit if they so choose. The certificate program in human resource management requires seven courses, including two core courses, one elective and major courses in the areas of human resource administration and employee relations. Human resources management students also have the opportunity to participate in student groups like the Society for Human Resource Management (SHRM). Ferris State University's College of Business offers a Bachelor of Science degree in human resources management that is accredited by the Accreditation Council for Business Schools and Programs (ACBSP). Students learn about key HR topics such as employment law, compensation, recruitment and selection, employee benefits, and negotiation. As part of the College of Business, the program also provides students with a fundamental business education including courses in finance, accounting, international business, management, and marketing. An Advanced Studies Certificate in Human Resource Management is also available. No more than 50 percent of the required credits for the certificate may be transferred from another program or institution. HRM students enrolled in the bachelor's program are required to complete an internship in order to graduate. The School of Labor and Employment Relations at the University of Illinois at Urbana-Champagne offers a Master of Human Resources and Industrial Relations (MHRIR) degree that is designed for practicing professionals. A Doctor of Philosophy program is available for HR/IR researchers and teachers. The MHRIR degree can be completed in three semesters and students can choose a thesis or non-thesis program. Joint degree programs are available for students who want to earn an MBA or a JD degree at the same time as their MHRIR degree. The MHRIR program is also available online. Classes are offered both in hybrid synchronous and asynchronous formats, giving students a great amount of flexibility. The school offers research assistantships, tuition waivers, and fellowships to qualified students. Michigan State University's Department of Management offers a BA in Human Resource Management and an MBA with a specialization in human resource management. The BA in Human Resource Management includes general business coursework, as well as foundational human resource courses. The human resource management MBA includes 12 credits of concentration courses. Additionally, the School of Human Resources and Labor Relations offers a 36-credit Master of Human Resources and Labor Relations which covers seven core knowledge areas: human resource management, strategy and firm performance, international human resources and labor relations, organizational change leadership, workplace law and analytical skills for human resources and labor relations. Students can also choose to concentrate their studies in any of these seven areas by taking electives in their area of interest. The Department of Management at Minnesota State University-Mankato offers an undergraduate major in management with a specialization in human resource management. An undergraduate minor in human resource management is also available. Management majors who choose to specialize their studies in human resource management are required to complete 15 business foundation courses and eight human resource management courses in subjects like employment and labor law, staffing, compensation management, training and development, and human behavior. Human resource management students are also required to choose an elective and have the option to complete an internship or practicum to satisfy their elective credits. Additionally, management majors have the opportunity to participate in student organizations like the Human Resource Management Club. The College of Liberal Arts at Towson University offers a Master of Science (MS) in Human Resource Development program. Students admitted to this interdisciplinary program have the freedom and flexibility to individualize their program of study according to two tracks - the Educational Leadership Track or the Professional Track. The Professional Track focuses on the practices and principles of human resource development and management, and accepts individuals with or without experience in the field. Most courses are delivered via face-to-face classroom instruction, but the program does offer occasional online instructional opportunities. The College of Business Administration at the University of Nebraska Omaha offers a Master of Business Administration (MBA) program that lets students choose Human Resource Management (HRM) as their area of concentration. The HRM concentration prepares students to manage a variety of human resource functions including compensation, employee recruitment, selection and retention. There is also a Graduate Certificate in Human Resources and Training (HR & T) available. In order to complete the program, students take graduate-level theory and application courses from the fields of Communication, Business and Psychology. The programs offered at UNO's College of Business are accredited by the AACSB International, the Association to Advance Collegiate Schools of Business. Students interested in human resources may pursue a Bachelor of Science in Human Resource Management at Dickinson State University. In this program, students will gain a basic understanding of accounting and financial management, economic concepts, the management process, business analysis, information systems, equal opportunity laws, compensations and benefits, employee and labor relations, and more. This degree is available on campus or online, and students must have a cumulative grade point average of 2.25 or higher in order to graduate. Required courses include general education courses, business core courses, electives, and human resource core courses such as human resource management, staffing and workplace diversity, compensation management, and human resource development. Students at Texas Woman's University who wish to pursue a Bachelor of Business Administration (BBA) program with a major in Human Resource Management (HRM) can do so at the School of Management. TWU's business programs are accredited by the Accreditation Council for Business Schools and Programs (ACBSP). The program is designed to provide students with the skills necessary to handle key HRM functions including union-management relations, selection procedures, sources of labor supply, the global HRM field, benefits, compensation, and legal practices. HRM students are encouraged to join the Society for Human Resource Management (SHRM) to take advantage of networking opportunities and to learn from industry practitioners by attending lectures, seminars, and social occasions. The College of Business and Economics at West Virginia University offers a Master of Science in Human Resources and Industrial Relations (MSIR). The program has an exceptional reputation for equipping students with the necessary knowledge to pursue successful human resources careers. Graduates often go on to pursue work in a variety of functions such as human resource management, facilitation and consulting, equal opportunity compliance, labor relations, training and development, and employee plans administration, among other things. Students have the option to pursue the global track, which includes a study abroad semester at the University of Strasbourg in France. The Goddard School of Business and Economics at Weber State University offers a Bachelor of Science in Business Administration (BSBA) program that gives students the option of selecting human resource management (HRM) as their area of emphasis. The HRM emphasis requires the completion of the following courses: employment and labor law, information technology for business, managerial communications, human resource management, influence and group effectiveness, compensation and benefits, and staffing organizations. Students can further customize their program by taking electives in areas that complement their HRM studies (labor economics, training, negotiations, etc.). A total of nine credits of electives is required. Programs offered by the Goddard School of Business and Economics are accredited by the Association to Advance Collegiate Schools of Business (AACSB). The Terry College of Business at the University of Georgia offers a full-time Master of Business Administration (MBA) program that allows students to choose Human Resources Management as their area of concentration. An interdisciplinary program, the MBA in Human Resources Management combines courses from three UGA sources - the College of Education, the Department of Psychology, and Terry College of Business. Students admitted to the program acquire skills and training in business strategies, data management and analytics, employment law, industrial psychology, leadership and negotiations, and risk management. The program provides students with the proficiency necessary in the effective and efficient management of human capital in a variety of business settings and organizations. The College of Business and Economics at the University of Idaho offers a Bachelor of Science (BS) in Business, Management and Human Resources program. Students admitted to the program can choose from the following areas of Human Resources Management emphasis: Developing and Managing Reward Systems, Organization Design and Changes, and Maintaining Employee and Labor Relations. A number of scholarships are available for CBE students, including the Robert Clark/Albert Gordon UEC Scholarship ($1,200), which gives preference to female and minority students. CBE students who wish to study abroad can apply for the College of Business and Economics Study Abroad Scholarship or the Kimberly Farnen Study Abroad Scholarship. The University of North Texas offers a Bachelor of Business Administration in Organizational Behavior and Human Resource Management. Students who graduate from this program often go on to work in human resources. Also, they often pursue positions as compensation managers, recruiters, industrial relations managers, education or training managers, human resource generalists, and equal employment opportunity officers. Courses in the program focus on employee and labor relations, legal aspects of employment benefits, workplace health and safety, recruitment, selection, and placement, and compensation and benefits administration. Students may participate in the student chapter of the Society for Human Resource Management and the Professional Leadership Program for additional support in the field. The Kelley School of Business at Indiana University-Purdue University offers a Bachelor of Science in Business with a major in human resource management. Additionally, the Purdue School of Engineering and Technology offers an undergraduate certificate in human resource management. The curriculum for the BSB in Human Resource Management teaches students about traditional human resource principles like personnel administration and labor relations, as well as behavioral sciences with practical applications in the human resources field. The undergraduate certificate in human resource management is a 21-credit program that teaches students about training methods, personnel law and labor relations, among other areas. Students enrolled in human resource management programs can also join the student chapter of the Society for Human Resource Management. The Human Resource Management program offered by Rutgers University's School of Management and Labor Relations includes bachelor's, master's and PhD degrees. The BA in Human Resource Management, which is offered jointly by the School of Management and Labor Relations and the School of Arts and Sciences, requires 27 major credits. The Master of Human Resource Management requires 36 credits, with coursework in four areas: HR strategy, HR decision making, HR functional areas, and HR context areas. A PhD in Industrial Relations and Human Resources is also available. Scholarships available to human resource management students include the BASF Undergraduate Human Resources Scholarship and the Pamela Sue Schmidt Award for Outstanding Service to the Community. The College of Education and Allied Professions at Western Carolina University offers a Master of Science in Human Resources (MSHR) program. The curriculum for this program has been designed to align with the business/policy knowledge applications recommended by the Society for Human Resource Management (SHRM). Students have the option of pursuing this program off-campus since all core and elective courses are available online. Courses cover key HR content areas and include the following: Organization, Planning & Execution for HR Professionals, Human Resources Research & Evaluation Methods, and Employee and Labor Relations. The college offers a program of study that makes it possible for students to complete their MSHR degree in three years. The College of Business at the University of Texas Arlington offers a Master of Science (MS) in Human Resource Management program that is designed to give students a broad-based foundation in business as well as specialized knowledge in human resource management. Students take a wide variety of courses that include employee selection, talent management, compensation and benefits, training and development, HR law, and HR analytics. Students admitted to the program can choose a thesis track or a non-thesis track. MS-HRM students have the option of concurrently earning a Master of Business Administration (MBA) degree through the dual degree program offered by the department. The College of Extended Learning at San Francisco State University offers a Professional Development Certificate in Human Resources Management. Students can choose from four certificate programs: HR Practices, HR Management, HR Leadership, and HR for Non-HR Practitioners. HRM courses are typically scheduled on two consecutive Saturdays or four weekday evenings. Four-course certificate programs must be completed within two years, while eight-course certificate programs must be completed within three years. Courses for the HR Practices Certificate cover topics such as employment laws, regulations, and compliances, compensation and benefits, employee relations, workforce development, and managing institutional transformation. Students who complete the HR Practices certificate can take an additional four courses to earn the HR Management Certificate or eight courses for the HR Leadership Certificate. The School of Business at Emporia State University offers a Bachelor of Science in Business Administration degree that gives students the option of selecting human resources management (HRM) as their area of concentration. The curriculum includes courses that cover essential topics in human resources management such as compensation and benefits, organizational behavior, supervisory management, marketing analytics, and entrepreneurial management. The completion of 24 credits in the area of concentration is required for the degree. As part of the School of Business, HRM students can apply for a number of business scholarships, including the Distinguished Business Scholar Award ($2,500) and the Kevin E. O'Connor Scholarship (variable amount). Emporia's School of Business is accredited by the Association to Advance Collegiate Schools of Business (AACSB). Fitchburg State University offers a Master of Business (MBA) in Human Resources Management degree that can be completed in just 17 months. The program is available online. Students accepted to the 30-credit MBA program enroll in a total of 10 courses, each with a duration of seven weeks. Courses have to be taken in the prescribed order. To complete the HRM concentration, students must take the following courses: legal issues in human resources management, the human resource function and the manager, and selected topics in management. The program follows a cohort learning format with small class sizes that encourage interaction among students, as well as between students and instructors. Although courses are offered asynchronously, students are required to maintain regular course participation. The University of Texas in San Antonio offers a Bachelor of Business Administration degree in human resource management (HRM) through the Department of Management at the College of Business. In addition to the core curriculum requirements, students must complete the core body of knowledge for the College of Business and 39 credits in the major at the upper-division level. Required coursework covers topics such as training and developing employees, managing human resources for competitive advantage, compensating employees, human resources law, and organization communication. As part of the College of Business, full-time HRM students can apply for a number of scholarships, including the following: Ruth and Dan Bates Annual Scholarship ($5,000), Rabenaldt Annual Scholarship ($1,500), and the Presidential Scholarship ($1,000 per year). Tarleton State University offers a Master of Science in Human Resources Management. This degree program strives to provide students with the necessary skills and knowledge to become competent and successful Human Resource professionals. The degree program is a 30-hour program, and a good portion of the program may be completed online. The program is accredited by the Accreditation Council for Business School Programs. Over the course of the program, students will study and develop critical skills in the areas of recruitment and selection, compensation and benefits, training and development, and research and job analysis. The College of Business and Economics at the University of Wisconsin Whitewater offers a program of study that leads to a Bachelor of Business Administration (BBA) degree with a major in Human Resources. HRM students can apply for the Russell E. Jacobson Management Scholarship ($500) and the Dale Scharinger Scholarship ($500). The college offers a Master of Business Administration (MBA) program that lets students choose Human Resource Management as their area of emphasis. There is also a Graduate Certificate in Human Resource Management available. This program offers courses in key HR function areas such as compensation and benefits, management and labor relations, staffing and evaluation, strategic management of human resources, and training and development. The College of Technology at the University of Houston offers a Bachelor of Science (BS) in Human Resource Development program through the Department of Human Development and Consumer Science. The department also offers a Master of Science (MS) in Human Resource Development program. Qualified undergraduates can take advantage of the accelerated BS/MS program offered by the department, which allows students to earn both degrees in a shorter amount of time than it would take to complete the two degrees separately. The department offers another master's program - the Executive Master's Degree in Human Resource Development (ExHRD). This is an accelerated one-year program that requires students to complete action research projects that relate to change and learning in a work setting. Butler County Community College offers an Associate in Applied Science degree in human resource management (HRM) that combines practical and theoretical knowledge in the field. The 63-credit curriculum includes coursework that cover essential HRM topics such as employment law, labor relations, training and development, staffing, compensation, and strategic leadership management. In addition, HRM students can enroll in non-business courses that can complement their education, including financial accounting, business mathematics, micro-computing applications, and the psychology of human relationships. Students admitted to the program must complete a practicum period in order to earn the degree. Butler also offers a 33-credit Human Resource Specialist Certificate. Students who complete this program are eligible to sit for the Society for Human Resource Management (SHRM) certification. Students interested in pursuing a degree in human resource management (HRM) at Ball State University have the option of enrolling in either a Bachelor of Arts or Bachelor of Science program. Both degrees are accredited by the Association to Advance Collegiate Schools of Business (AACSB). The university's HRM program is one of only two such programs offered in Indiana. Students complete 42 credit hours of business foundation courses in addition to 27 credit hours of specialized HRM coursework. The curriculum covers essential HRM topics such as labor economics, employee development, and employment law. Miller College has an established internship program that provides students with hands-on experience in the field, as well immersive learning opportunities in a student's area of interest. The Bachelor of Business Administration (BBA) program at WMU's Haworth College of Business offers a Human Resources Management major. The program prepares students for careers as human resource generalists (compensation, benefits, training), human resource service supplier (staffing specialist/supervisor, labor recruiter), or management trainer (sales trainer, executive team leader). The program also prepares students for graduate studies and certification programs. As part of the Haworth College of Business, HRM majors can apply for scholarships that are made available by the college to its students, such as the Valenti Scholarship and the Kalamazoo Gazette Unendowed Scholarship. Each scholarship awards $2,500 per year, with the Kalamazoo Gazette Unendowed Scholarship giving priority to under-represented groups at WMU such as African Americans, Hispanics, and Native Americans. At the University of Central Oklahoma, the Management Department is part of the College of Business. The department offers a Bachelor of Business Administration (BBA) program that allows students to choose human resource management as their major. The curriculum equips students with the knowledge and skills necessary for core HR functions such as: recruitment and selection, strategic benefits and compensation systems, HR compliance, and employee training and development. The university hosts the Human Resource Society, which is a student chapter supported by the Society of Human Resource Management and the Oklahoma City Human Resource Management Society. The Associate of Applied Science degree in human resource management available at Western Technical College offers coursework that cover the seven essential areas of human resources: compensation and benefits, employment law, HR administration, international human resources, safety, staffing, and training. Students admitted to the program are required to take 69 credits to earn the degree. Students who complete the program can take advantage of articulation agreements that Western Technical College has established with the following schools: Cardinal Stritch, University of Wisconsin (La Crosse, Oshkosh, and Platteville), and Viterbo University. The agreement facilitates the transfer of a student's AAS credits to a four-year program in a related field at these universities. An 18-credit certificate in human resources is also available. Human resources managers are tasked with the administration, support and maintenance of an organization’s workforce. They maximize employee talent, hire new staff, handle staffing issues and advise management on policies including sexual harassment and equal employment opportunity. Although professionals with a master’s degree or graduate certificate often land higher-level management jobs and receive better pay than bachelor’s degree holders, all HR graduates can expect a stable job outlook, with growth that is on par with the occupational average. Professionals with a background or education in IT will be more in demand as the use of computerized human resources information systems continues to grow. Ready to put your people skills to work? Your first step is to earn a degree. In each section below, you can learn more about your options (e.g. MS vs. MBA), what courses to expect and your career opportunities after graduation. If you’re compiling a shortlist, check out our advice on accreditation (e.g. regional vs. national) and voluntary certification (e.g. HRCI’s PHR vs. SHRM’s CP). An associate’s degree in human resources is a 2-year undergraduate program that gives students a solid foundation in human resources. Programs can be found in community colleges, training institutes, colleges and universities. A high school diploma or the equivalent is required to apply. Most employers expect HR professionals to hold a bachelor’s degree, so students often use the associate degree as a springboard to more education. If you’re considering this path, make sure your course credits will be transferable to a bachelor’s program. Associate of Arts (AA) in Human Resources: Often designed to prepare students to transfer to a 4-year bachelor’s program. Curriculum includes liberal arts courses. Associate of Science (AS) in Human Resources: Like the AA, this is frequently used as a transfer degree. Curriculum includes science and math courses. Associate of Applied Science (AAS) in Human Resources: Often earned by students who wish to go straight into the workforce. Most associate’s degrees are a judicious blend of general education subjects (e.g. communication, statistics, English, etc.) and fundamental courses in human resources. Students may tackle issues such as personnel recruitment, labor relations, employee compensation and benefits, staff training and development, ethics, employment law and more. A bachelor’s degree in human resources is a 4-year undergraduate program that covers every important aspect of human resources. A high school diploma or the equivalent is required to apply. Most employers require HR candidates to hold a bachelor’s degree in human resources or business administration or a degree with substantial HR coursework (e.g. industrial relations, organizational development, employment law, etc.). They also like to see work experience, so look for degree programs that organize internships and training. Bachelor of Arts (BA) in Human Resources: Curriculum includes liberal arts courses. Bachelor of Science (BS) in Human Resources: Curriculum includes science and math courses. Bachelor of Business Administration (BBA) in Human Resources: Typically offered by the business school. The curriculum includes core business courses. Courses will depend on your choice of degree. In a BA or BS, you may be required to take general education courses in humanities, science and/or math. In a BBA, your curriculum may include business classes such as accounting, finance, statistics, marketing and information systems. Most programs try to have a mix of all of the above. Some programs will also prepare you for professional certification exams and/or provide you with internship opportunities. Both of these can be extremely helpful when you hit the job market. Check with the school’s website to see if these are offered, then ask to see employment statistics for HR graduates. A master’s degree in human resource management is an intense 1-2 year graduate program focused on HR managerial concepts, theories and tools. Students received advanced business training that prepares them for senior-level positions. Candidates need a bachelor’s degree to apply to a master’s program, but it doesn’t have to be in human resources. A BBA or a BS/BA in a related HR field (e.g. IT, finance, education, etc.) can be just as helpful. Master of Arts (MA) in Human Resource Management: A specialist HR degree focused on human resource management and related topics. Master of Science (MS) in Human Resource Management: A specialist HR degree focused on human resource management and related topics. Master of Business Administration (MBA) in Human Resource Management: Typically gives students a broader understanding of business and management than an MS or MA. For some management positions, you also have the option to pursue a master’s degree in labor relations or business administration. Check with your mentors and academic advisors about which degree is right for you. In certain fields, the MBA (and its focus on business operations) may carry greater weight with employers. Many master’s programs allow candidates to choose a concentration (e.g. training and development, human capital management, benefits and compensation, etc.). The degree culminates in a research-based thesis or capstone project. It’s a statistical fact that HR professionals with a master’s degree or graduate certificate earn more money than less credentialed peers. According to the BLS, employment of HR managers is projected to grow 13% from 2012-2022, about as fast as average. However, the medial annual wage was $99,720 in May 2012, higher than the average for management occupations. The top 10% of HR managers earned more than $173,140. The Doctor of Philosophy (PhD) in Human Resources is a 4-7 year program targeted at those who wish to teach at the university level or engage in high-level research. After taking foundational courses in areas such as statistics, research methods and practical applications, PhD students typically conduct original research in areas such as workforce development, organizational leadership, labor relations and HR management. They then detail their findings in a lengthy dissertation. Some PhD graduates end up teaching HR at colleges and universities. Others conduct research and policy work for the government and private sector. You don’t need to have a PhD in order to become a Vice-President or Director of HR. A master’s degree is the common requirement for high-level business jobs. A certificate in human resources is a non-degree program that takes a few months to one year to complete. Certificates are offered by a variety of academic institutions and come in 2 flavors (see below). Although they may help you to prepare for PHR/SPHR exams, HR certificates from universities are not the same thing as professional certification. If you’re thinking of earning a certificate as preparation for a bachelor’s or master’s degree, make sure your course credits will be transferable to your preferred program. Undergraduate Certificate: Available to high school graduates. Many students use this certificate as a way to test whether they’d be interested in HR as a career or to earn credits for an undergraduate degree. Graduate Certificate: Available to those who hold a bachelor’s degree. Professionals often use this certificate to make a move from one field of HR to another, advance their careers or earn credits for a master’s degree. Some certificates – especially at the undergraduate level – serve as a general introduction to the field. These will include many of the HR courses you might see in an associate’s degree. Some certificates – especially at the graduate level – focus on a specific area of HR (e.g. employee relations, benefits and compensation) and are used for professional advancement. Undergraduate certificate holders may be able to find assistantship roles while they work towards a higher degree. Graduate certificate holders often use their qualification to climb the career ladder to management positions. Regardless of which degree you choose, we recommend you attend a college or university with regional accreditation. This is a “seal of approval” granted to institutions (e.g. non-profit and public colleges and universities) by one of six regional accrediting bodies (e.g. Southern Association of Colleges and Schools). Regional accreditation only applies to a college or university, not the program itself. If you’re considering a BBA or MBA, ask about their business school accreditation. There is no specific accreditation needed for HR degrees. AACSB is generally considered the gold standard. We take a closer look at these in our article on affordable MBA programs. As you make your way into the HR field, you’re going to encounter many peers who hold professional certification. There are now two major certification bodies – HRCI and SHRM – and a lot of debate about which one is better. HRCI offers the well-known PHR, SPHR and GPHR certifications. SHRM has recently developed new CP and SCP certifications. We cover the pros of each in the sections below. Professional certification is expensive (e.g. test fees, study materials and prep courses), time-consuming and hard. However, if you’re looking at the long-term benefits, it may well be worth it. In its survey on The Value of the PHR and SPHR, PayScale found that certified professionals could earn up to $20,000 more than non-certified peers. What’s more, some mid- to senior-level job descriptions specify that candidates be certified. That means you might not make it past the first round of applications without the magical letters PHR or SPHR listed on your résumé. The HR Certification Institute (HRCI) is responsible for the industry-standard PHR/SPHR certifications and currently certifies 135,000+ HR professionals. As one certificate-holder put it, the SPHR is the closest thing the HR profession has to the accounting CPA. Professional in Human Resources (PHR®): Intended for early career professionals. Senior Professional in Human Resources (SPHR®): Intended for experienced HR professionals. Global Professional in Human Resources (GPHR®): Intended for professionals managing HR in multiple countries. There are also a number of HRCI specialty certifications. Check HRCI’s eligibility requirements to determine which certification you can pursue. All certification programs have education and hands-on experience prerequisites. If you are eligible to take both, take the pre-exam quizzes to decide where you sit in terms of experience. The SPHR exam is more complex and requires a deeper understanding of HR issues. As of 2015, PHR and SPHR are still the most recognized qualifications on the market. But watch this space – you may start to see employers demanding SHRM’s CP and SCP as well. The Society for Human Resource Management (SHRM) is one of the most respected HR organizations in the country. Many schools use SHRM’s HR Curriculum Guidebook and Templates to develop their programs. Originally, SHRM was not a certification body. Instead, it supported HRCI certifications with learning modules for the exams. After a time, the organization decided to create their own credentialing system based on the SHRM Competency Model. SHRM Certified Professional (SHRM-CP): Intended for HR professionals who implement policies and strategies, serve as point of contact for staff and stakeholders, deliver HR services and perform operational HR functions. SHRM Senior Certified Professional (SHRM-SCP): Intended for HR professionals who develop strategies, lead the HR function, foster influence in the community, analyze performance metrics and align HR strategies to organizational goals. As with many certifications, applicants must pay a fee and take an exam. These certifications came into effect in 2015. Although both organizations are sugar-coating the issue, CP and SCP certifications are now in direct competition with the PHR and SPHR. It may take a few more years for the dust to settle and accepted standards to emerge.